I felt the need to draw and share these maps to illustrate the first stages of the Kurgan (Indoeuropean) expansion. Some other details are added for contextualization. Vasconic is tentatively associated here with Neolithic languages of Thessalian origin (my main working hypothesis). It would at the time be the largest European language family therefore. 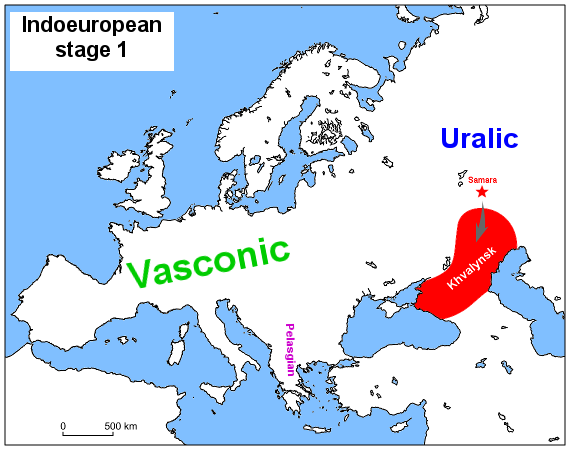 Uralic should be right north of the early Indoeuropeans, what explains their ancestral Sprachbund. Pelasgian indicates the language of Vinca-Dimini (Grey Ware), which was a limited intrusion c. 5000 BCE with origins related to Tell Halaf most likely. Western Indoeuropean (Baalberge): a large subfamily that would give birth to Balto-Slavic, Germanic, Celtic and Italic. Possible seeds of Tracian, Greek, etc. in the Balcanic Kurgans, an ill-defined group that would nevertheless plunder and radically alter the ethnic geography of the Eastern Balcans (see next map). The Anatolian branch goes into Asia with the Kura-Araxes culture. Ezero, rather Dniepr-Don (→ Sredny-Stog II) cultural inheritance. Surely proto-Thracians and hence a candidate for the origin of Armenian (via Phrygians). Consolidation and first expansion of the Western IE branch (Globular Amphorae). 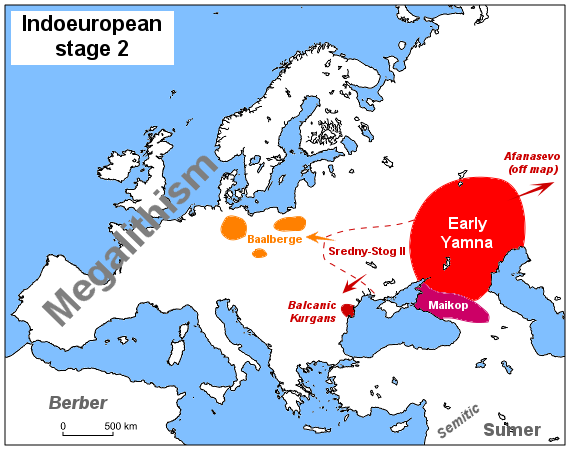 It may be important to note that in the Baalberge→→→Globular Amphorae period, this Kurgan culture experimented various influences that may be considered Vasconic: the Danubian substrate, the powerful southern Danubian culture of Baden and the Northernly Funnelbeaker influence, associated to Atlantic Megalithism. Corded Ware: a major expansion of the Western IE group to the West, East and North. Vucedol: probably associated with the previous, eradicates the Danubian culture in their homeland (only Foltesti in Moldavia would survive for some more time within this important Neolithic macro-culture). Vucedol would be another candidate for Greek origins for their use of the architectural concept of megaron. Catacombs culture's origins are debated but it's clearly Kurgan in any case. Poltavka represents continuity with the seed of the Kurgan/Indoeuropean phenomenon and its later evolution leads directly to Indo-Iranians. It should be noted that, synchronously with the Corded Ware expansion, the Megalithic bowmen of Artenac culture expanded from Dordogne, subsuming the last Western Danubian groups all the way to Belgium. This culture was probably proto-Aquitanian. A whole millennium of stability followed at the new Rhine border, crossed only by the likely traders of the Bell Beaker phenomenon. Update (Feb 20 2015): please check this study by Will Chang et al. : ANCESTRY-CONSTRAINED PHYLOGENETICANALYSIS SUPPORTS THE INDO-EUROPEAN STEPPE HYPOTHESIS, which provides an approximate chronology that is quite revealing and that largely (although not strictly) fits the previous outlined scheme of archaeological foundations. Also for those particularly skeptic, taking a look at the genetic evidence outlined in Haak 2015 and discussed HERE may be of use. False, Globular amphore is not the root of corded ware, the root from corded ware and globular amphore is funnelbeaker. Result, corded ware not from easteurope, she is from middle europe. Other problem, i cant found a kurgan what is older as 3500 BC, what is the time of tumuli in europe. they are better qualificated to build a kurgan as a asian population. 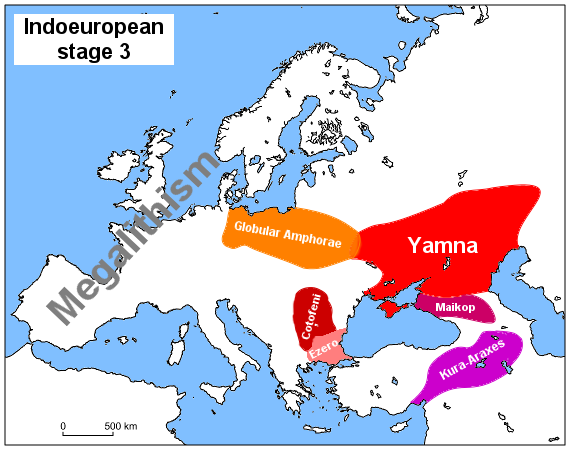 yamnaja horizont has more european peoples, not asian population. forget your kurgan these, search a new these. Are you talking of pottery shapes? Because funnelbeaker is just that: a pottery style that extends through many different cultures in an area effect radiating from Denmark, where it's associated with Neolithic and Megalithism (this last also in other areas but not at the Elbe-Saale nor further East). As for Corded Ware, it is chronologically and culturally derived from Globular Amphorae by all accounts. The main issue, if any, is the presence at an early stage of a Catacomb element in Cujawia (but nowehere else in the cultural area) which may have triggered the cultural change. But otherwise GA → CW is almost linear, site by site. 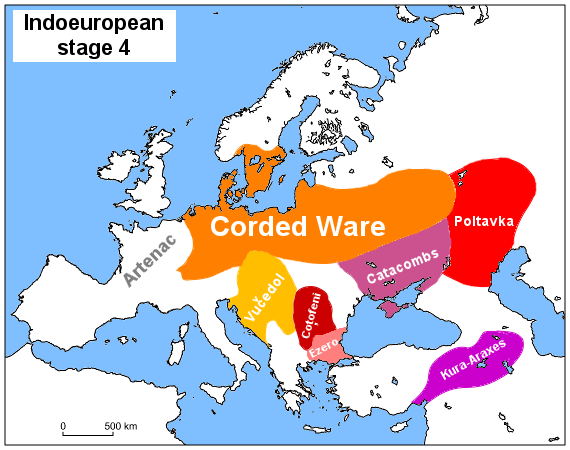 And the result is... that Corded Ware is indeed from Central Europe: right where Globular Amphorae existed. Here Gimbutas explains well why the Khvalynsk culture is at the origin of the Sredny-Stog II intrusive element. Oddly enough it seems one of the best references online other than Wikipedia. What happened to popular education promoted by public universities and all that?! We have to do it all with nearly no resources ourselves. "yamnaja horizont has more european peoples, not asian population." You look like ranting about a geographic border that does not really exist between Europe and Asia. The fact that you avoid capital letters, proper punctuation and you structure so badly your extremely short dogmatic sentences make me feel you're not serious in your questions, are you? I say because I hate to waste my time.